A barber was allegedly assaulted by soldiers after cutting the wrong hairstyle for a man's daughter yesterday in Asaba, Delta state. According to an online report, trouble started after the barber couldn't perfect the hairstyle the man wanted for his daughter - thereby prompting the man not to pay as he took his daughter to another saloon. It was reported that this morning, the man stormed the barber's shop with soldiers and assaulted him. 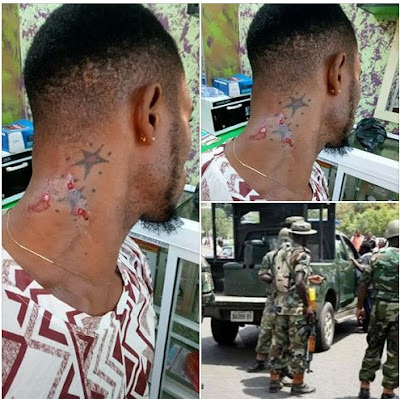 BARBER ASSAULTED IN ASABA BY SOLDIERS FOR CUTTING WRONG HAIR STYLE. Received a call from a barber to please rescue his boy from further maltreatment by soldiers (fully dressed in Army Uniform). We couldn't get to the scene due to wrong address given by the caller. (Apologies). The man who led the soldiers took her daughter to the saloon yesterday to cut her hair and told the barber the hair style he want for his daughter. Unfortunately, the barber couldn't perfect the hair style and the man refused to pay, took his daughter to another barber shop. At about 9:46am, this morning he stormed the barber shop with soldiers and assaulted the barber. We asked the neighbors around and they gave same statement. We care about this young man and you. Does the barber deserve such maltreatment?